Though it was at first thought this was caused by pollution, this is not the case, it is caused by water fern, an invasive non-native species, Alan Tilbury reports. It seem the recent spell of unusual warm weather caused the early growth, that is normally controlled by its predator a weevil, a beetle-like insect that feasts on the fern during Spring, but the growth of the fern was too early. However, Canal & River trust maintain that the invasive plant is not harmful to either humans or animals—dog walkers concerned for their pets. Lancaster Post reported that some had thought the canal had been filled in and turned into a cycle track! The plant is named Azolla (Azolla filiculoides) and it is a floating aquatic fern that spreads by stem fragments and spores, the trust explains. 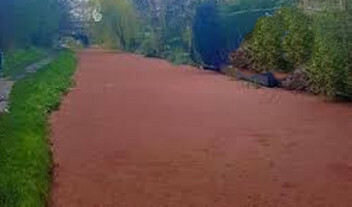 It is an invasive non-native species which initially appears green, like duckweed, but soon turns a red or brown colour. Despite being harmless to both people and wildlife, the plant is difficult to remove and is expected to thrive in the canal until at least May, when its natural predator, the weevil, comes on the scene.